Asus ZenFone 3 Deluxe Special Edition Vs Samsung Galaxy Note 7 Specs Comparison! Home / asus / mobile / news / Asus ZenFone 3 Deluxe Special Edition Vs Samsung Galaxy Note 7 Specs Comparison! Yesterday, everyone was surprised with the announcement of the ZenFone 3 Deluxe Special Edition, a handset with hefty price tag, but has the most powerful specs on paper found on any smartphone in the world today. 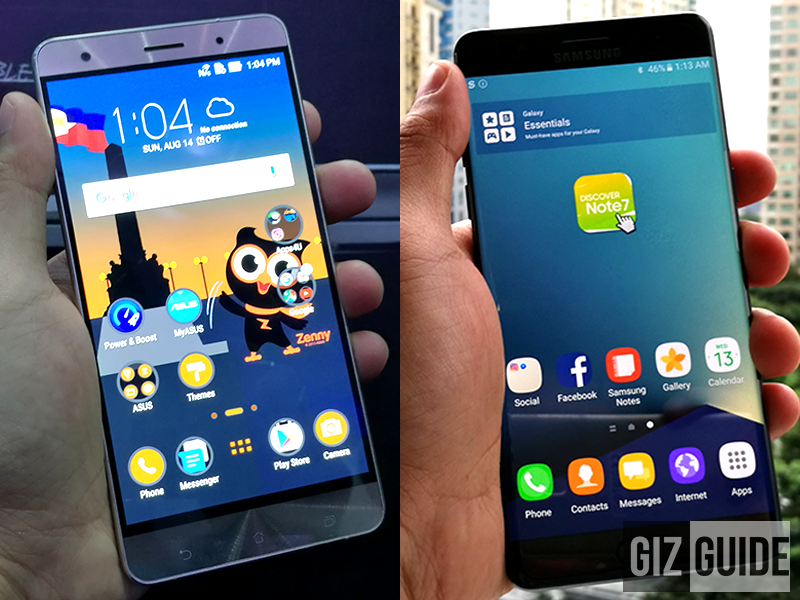 Asus ZenFone 3 Deluxe Special Edition vs Samsung Galaxy Note 7! It's the first to load with the powerful 2.4 GHz 64 Bit Snapdragon 821 quad core processor in the world, has 6 GB RAM, HUGE 256 GB, and the latest 23 MP Sony IMX 318 sensor w/ Tri-tech AF, 4 Axis OIS, Axis EIS and dual tone LED flash at the back. In this specs battle, we decided to pit it against the best of Samsung today, the Samsung Galaxy Note 7. Why? They're targeting the both price range and market segment of 5.7 inch high-end devices. On paper, it is clear that the ZenFone 3 Deluxe Special Edition has the edge over Samsung Galaxy Note 7. However, also keep in mind that having the highest processor, RAM, and storage around doesn't always mean that it is the best device. Based on what we experienced, the Note 7 still has an edge for me in terms of screen, camera, IP 68 dust / water resistance, and Iris scanner. Not to mention that it is also more affordable by 5K Pesos. Having said that, let's not jump into conclusion yet, proper side by side testing is a must to fully determine a rightful winner.